Free Spirit Publishing, 9781575421285, 24pp. “Crunch crunch crunch. Teeth are strong and sharp. Crunch crunch crunch. Teeth can help you chew. But teeth are not for biting. Ouch! Biting hurts.” Sooner or later, almost all young children will bite someone—a friend, a parent, a sibling. This upbeat, colorful, virtually indestructible book helps prevent biting and teaches positive alternatives. 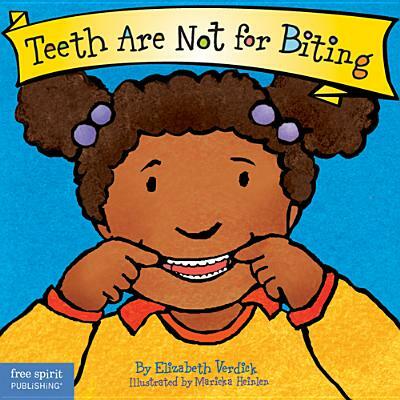 The companion to our best-selling Hands Are Not for Hitting Board Book, Teeth Are Not for Biting gives reasons why children might want to bite. Little mouths feel sore when new teeth come in; sometimes kids bite when they’re hungry, tired, cranky, frustrated, angry, bored, distressed, or seeking attention. Author Elizabeth Verdick suggests positive things children can do instead of biting: chew a chewy toy, drink a cold drink, get a hug, tell a grown-up. This book also includes helpful tips for parents and caregivers. Elizabeth Verdick is a children's book writer and editor. She lives in Minnesota with her husband and their two children. Marieka Heinlen launched her career as a children’s book illustrator with the award-winning Hands Are Not for Hitting. As a freelance illustrator and designer, Marieka focuses her work on books and other materials for children, teens, parents, and teachers. She lives in St. Paul, Minnesota, with her husband and son.